FACT#2: if you are reading this, and have symptoms it is highly likely that you are Canadian, or reside in a northern latitude of the USA. If not, your car likely lived, or operated in one of these latitudes at some time in it’s life leading up to the failure. Why? Well, we’ll go over that in our scheduled telephone consultation, if you decide to get more information about our program. NOTE: With M96/M97 bore scoring at early onset, and even intermediate stages of failure your engine may still “run perfectly!” Don’t be fooled, watch for the symptoms listed below and act early! If caught at early onset we may be able to save your engine without full reconstruction! 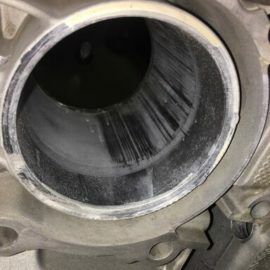 Sooty tailpipes are more common on the driver’s side of 996/997 cars, but can happen on either side if the issue is limited to one bank of cylinders. 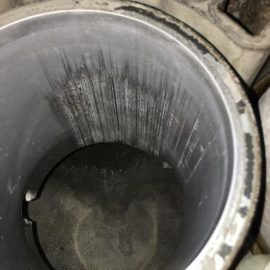 In situations where both cylinder banks have one or more failing cylinders, both tailpipes, or even the bumper may have signs of soot deposits. Increased oil consumption (at advanced stages of failure only) that can be as much as 1 liter every 100 miles driven! Misfires logged, flashing check engine lights P0300 DTCs are common at advanced stages only. Also catalyst efficiency codes are common, as the oil consumption kills the catalytic converters. You may also get DTCs for failing, or aging O2 Sensors due to oil fouling. Non- ferrous (non- magnetic) shiny aluminum debris found in the oil filter, and engine oil sump. This starts with a couple of small particles, and will increase in quantity with accelerated stages of failure. **See the video below for more symptoms, and subscribe to our “Rennvision” YouTube Channel to learn more. HELP! My engine has experienced this failure! Wear debris from the scored bores is very hard, and abrasive. 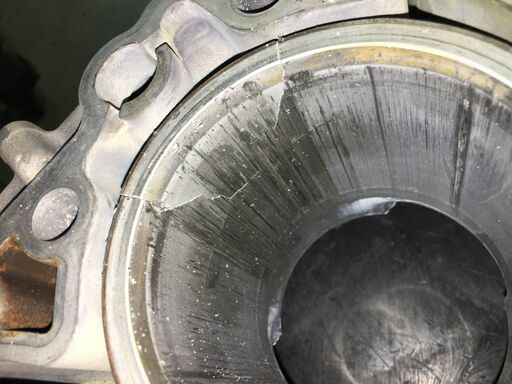 Engines operated with scored cylinder bores will suffer multitudes of collateral damages due to this wear debris being suspended in the engine’s oil supply, and being circuilated to all internal components. 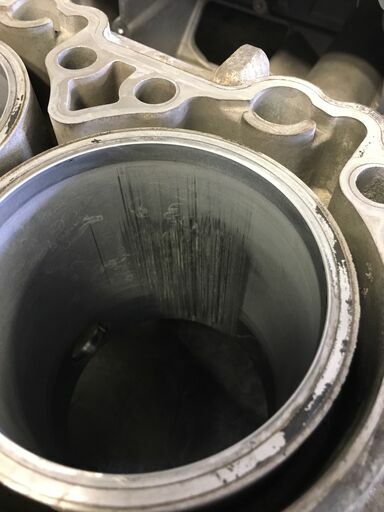 As the cylinders lose ring seal, due to the bore scoring, harmful fuel contaminates the oil as it bypasses the piston rings. This fuel enters the engine oil, thus reducing oil viscosity as it intrudes into the oil. Along with the fuel that bypasses the piston rings, is a dreadful mix of combustion byproducts, including trace amounts of carbon which will mix (suspend) with the engine oil, and be delivered to all internally lubricated components within the engine. 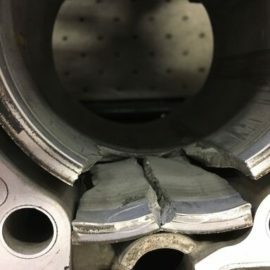 This carbon is very damaging to any components that it may encounter, so continued driving of vehicles with cylinder scoring (even if they “run perfectly”) can create extensive collateral damages. This will destroy bearings, chains, and other components including the remaining “good cylinders”. 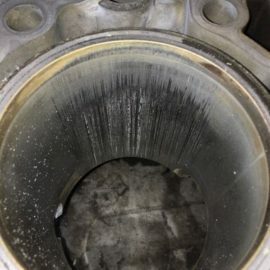 Put simply, if your engine’s oil is bypassing the piston rings due to bore scoring, then you must understand that carbon, and other contaminants are bypassing the rings in the opposite direction, and contaminating the engine oil. 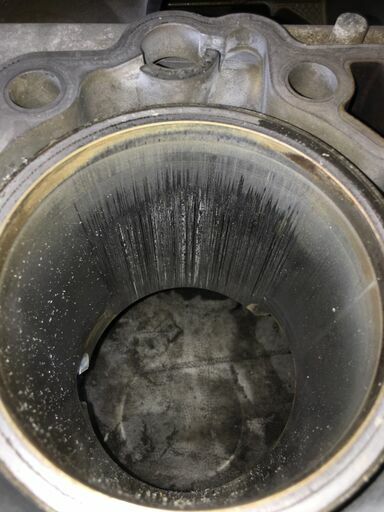 Further, fuel contaminated oil then loses its ability to protect the engine components, further increasing wear throughout the engine, as well as the cylinders. What you must understand is this condition will not get any better over time. Like anything mechanical, once wear begins it will accelerate. 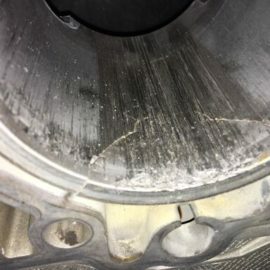 The amount of miles that your car has logged means nothing to this failure, as we have seen this occur with engines with less than 20,000 miles, and with engines as high as 260,000 miles. This failure is not prejudiced, and it will afflict engines that have been “perfectly maintained” as well as those that have been abused, neglected, or tracked to death. It will afflict these engines equally in 100% of the cases, with the same causes, effects, and symptoms. A common consensus among owners is “my car runs so good, and it has low miles, so this can’t be cylinder scoring”. Wrong. We actually see this failure occur to more low mileage cars, than high mileage cars, as the running clearances remain tighter, which actually adds to the condition. 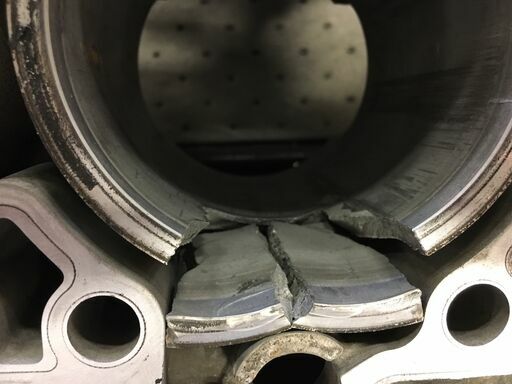 That may not make sense to you, but after you’ve seen several hundred cases, and have researched this failure with trend data, and direct experience for more than 15 years, it would.See the photo gallery at the bottom of this page for photos of typical cylinder scoring failures. 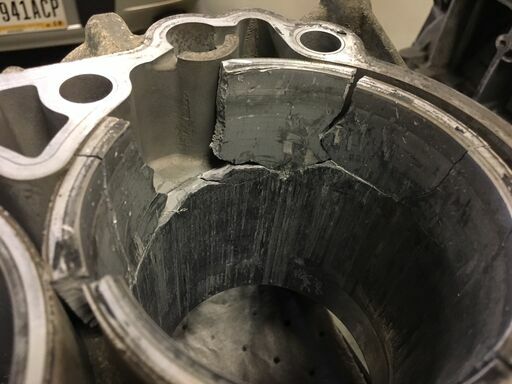 Note: If the engine is ran too long with this degree of damage, the scoring will lead to cylinder cracking, and ultimately a completely different level of failure. 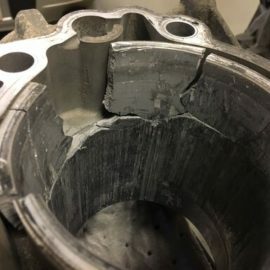 This failure will then be deemed “D- chunk failure” where the cylinder literally breaks, allowing coolant to flood the engine internals. When the cylinder breaks mechanical damage is extensive, and collateral component damage is great. Put simply- you don’t want that to happen to you. The moral of this story is if you have the symptoms that I have listed in this article, the issue will not get any better without action being taken internally within the engine. 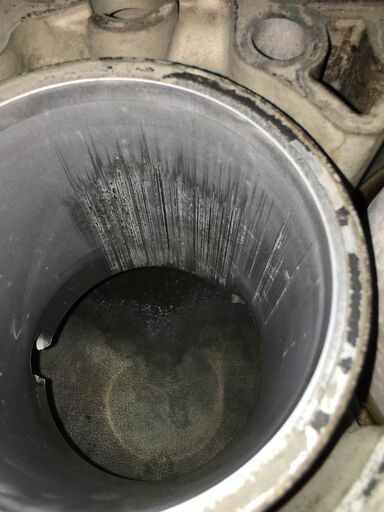 There’s no engine oil that will solve this, and there’s no single part that can be changed out to solve this condition. FACT: Since the beginning of our program, more than 15 years ago, our queue has been filled with engines that have suffered this mode of failure, exhibiting the symptoms below. 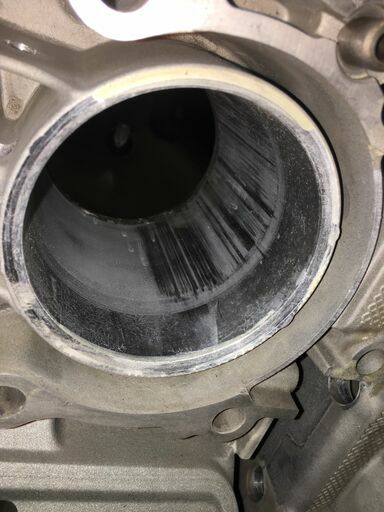 Over the last 5 years the numbers of bore scoring cylinder failures have quadrupled here, making cylinder bore scoring the #1 failure that leads to our services being sought out by Porsche owners. These failures are more often misdiagnosed than properly diagnosed, and can lead to lots of wasted money when the symptoms are mis- identified and local shops, or dealers just start replacing parts thinking that the issue is not mechanical. As an example, almost every engine that comes to us today has been botched by a local shop in some way. In regard to the cylinder bore scoring failure, 90% of these will have a new “air oil separator” fitted. Why? Because the “AOS” is a known issue that can make these engines consume oil. Rather than conclusively determining the condition of the AOS with a testing regimen using a crankcase manometer reading, they simply throw a new part at the engine. This will usually cost the owner around 1,000 bucks, and won’t solve a thing. Diagnosis of this failure often begins with tests using an “electronic ear”. Listening for the root of the noises the engine is making will clearly define this issue to those with an experienced, trained ear. Those that lack extensive, direct experience with the M96/97 engines may still believe this is a failure of a valve lifter. Trust that it is not in 95% of the cases we have seen first- hand. Often times shops less than experienced with this failure will choose visual “bore scope” procedures to view the “scoring”. Note that this method only works in advanced cases, (stage 3 &4 failure) where scoring has traveled further up the bore, and can be seen. In early stages, the scoring starts at the bottom of the cylinders, and is covered up by the piston while positioned at “BDC” for the visual inspection to be carried out. This often fools those that perform this test, as they see nothing wrong. Typically, since no scoring is visible, it supports the aforementioned narrative that the failure is a “lifter”. It is often at this time that thousands of dollars become wasted, performing a “lifter job” that does not address the issues at all. 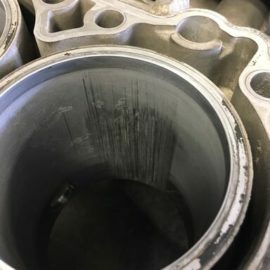 In other cases the general shop will often perform “leakdown” and “compression” tests in hopes of gaining more data to support the reasons of why the engine is making noise, and consuming oil. These will more than likely show nothing is wrong with the engine! Why? Because the cylinders that are failing often have oil enter the rings and cylinders in excess amounts, and this oil will act to “seal” the cylinder better. This fools the diagnostician that lacks direct experience with this failure, as it is counterintuitive. Why would a cylinder that’s having issues test better than the others? As we say “they don’t teach that at Porsche school, or at Wyotech! All this being said, normally shops do these tests for no other reason than to remove money from your wallet. Save that money, and put it toward a Flat 6 Innovations engine reconstruction. We have developed a specific (very unconventional) regimen to diagnose these issues, and share them in our hands- on training classes offered by www.theknowledgegruppe.com and we have shared this with over 1,400 Independent Technicians who have attended our classes worldwide since 2008. 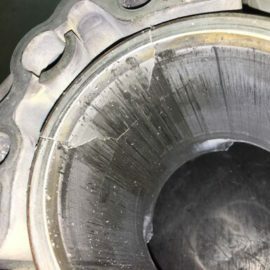 The biggest issues that we see with cylinder bore scoring stems from technicians not understanding how the failure occurs, and then treating the symptoms, rather than the root of the issue. Since the “engine runs so well” they never believe the issue could be internal. This is where you call in the “Specialist”, and take the car away from the “General Practitioner”. Cylinder bore scoring requires complete disassembly of the engine to overcome. There’s no way around this- no magic cures, no special oils, or potions. We must disassemble the engine, machine the original problematic cylinders away, and start over. This is no challenge for us- its another day at the office for our team, as we have build more engines afflicted with this mode of failure than anyone in North America. That said, over 1/2 of these failures we addressed for Canadian purchasers- no one is “too far” from our facility. If you are going to have an M96/ M97 engine failure, this is the one to have. Why? Well, its simple… Even though to properly address this issue the engine has to be completely disassembled, and extensively machined to overcome the issue (and make sure the instance doesn’t happen again) this is the failure that has the least amount of collateral damage to the remainder of the engine internals. We literally throw away all of the parts that are normally effected by this failure in 100% of our reconstructions, so the cost of overcoming this mode of failure is the same as our “elective reconstruction”. Thats right, if an engine comes to us having perfectly fine pistons, rings, and cylinders- we don’t care. The parts get thrown away so they can never be used again. These are replaced in 100% of the cases with our own proprietary pistons, rings, and cylinders fitted by LN Engineering. Though LN supplies prepared engine blocks for other builders you may run across in your research, our profiles of piston, ring, and cylinder roughness average cannot be attained by those other builders. Since engines that have only suffered “cylinder bore scoring” have the least amount of collateral damages, we charge the same amount to reconstruct these engines, as we charge to reconstruct an M96/ M97 engine electively. This makes the most common failure also end up being the cheapest failure to overcome. Nothing here is really “cheap”, and never will be, so let’s just say that cylinder bore scoring is the least expensive failure that is addressed with our reconstruction processes. Engines suffering scored bores must be properly reconstructed. Wise purchasers will choose our services, taking advantage of our developmental work with LN Engineering’s “Nickies” cylinder line. As LN’s first customers, dating back to 1999, we have been instrumental in the development of this cylinder technology. No one in the world has used more “Nickies” than Flat 6 Innovations. LN’s “Nickies” are not a band aid. All 6 cylinders of the engine are machined away and fitted with billet alumunim cylinders that are then Nikisil plated, like those of the famed Mezger aircooled engines. Nikisil is comprised of Nickel, Silicon, and Carbide, and is applied as a “plating” procedure. These are all hard, wear resistant materials that are plated onto the cylinder wear surfaces. These are not coatings! Don’t be fooled! Thats right, our processes were borrowed from the Mezger engines, and in fact we used these same procedures to create our Mezger based Porsche engines here. Some less- than- adequate “low cost” alternatives are things you will run across as you search this failure mode more, and more. 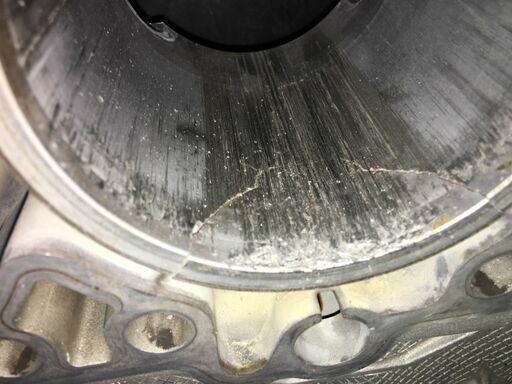 Never use a steel sleeve to repair this issue, as the expansion coefficients are incorrect, the engine will always be noisy, and will likely have more issues than the process solved. This isn’t a Chevy, its a Porsche, and it doesn’t deserve to be compromised with an iron/ steel sleeve. 100% of our engines have used LN “Nickies” since the beginning of our program. We will not perform reconstruction any other way. You should not either. It is at this stage that you must determine how much you love the car. That’s right, I said LOVE. This is a Porsche, and it should be all about a love affair, and not what a blue book value says the car is “worth”. Those who love the cars come our way, and have this issue addressed in a proven manner by the team that first identified this issue, as well as created corrective action for it. In our experience today, we will end up working with the top 1% of Porsche 996 and 997 owners who appreciate, love and value this car for their own reasons. Not a KBB value, not re- sale value, and not what their friends think about their Porsche. If you are like me, you understand that the 996 and 997 are the best water-cooled cars to own, as long as you give them a new “heart”. Put simply, if you love your Porsche and want to ensure that you don’t suffer the same failure twice, you only have one proven option, and you’ve just been reading about it, from the guy that perfected it. Wise purchasers will have their “research” end here.